How to Rebuild a Page for Door43.org? If you are seeing a warning message on your door43.org page or you aren’t seeing anything on your Door43 page, you can trigger a rebuild of the content to see if that fixes the issue. One easy way to trigger a rebuild is to make an update to the project’s content. If you are using DCS directly, you can use the web editor to make a simple change like adding a blank line to the README file. If you are using tS or tC, you could make a change in the app and then use the appropriate backup/upload mechanism to push those changes up to DCS. If you would like to manually trigger a rebuild without changing the content, you can do that by following this process. Go to your DCS project page and select Settings on the far right of the tabs (you’ll need to be logged in to your account). 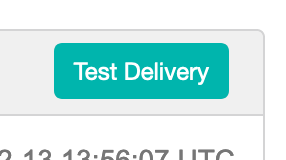 Scroll down and select “Test Delivery” on the right side of the page. Once the change is pushed to DCS (or the webhook has been triggered manually) the conversion process should start right away and the update should be available on the Door43 page within a minute or two (larger projects may require up to 5 minutes for a full rebuild).